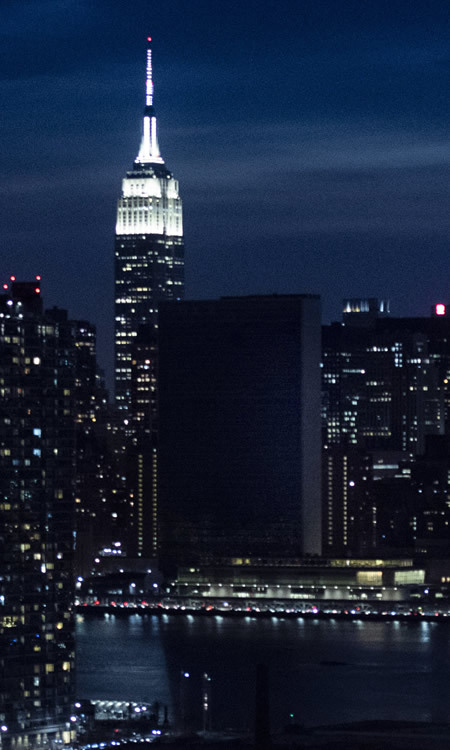 Photo: The United Nations participates in Earth Hour, a global lights-off event coordinated by the World Wildlife Fund (WWF) and other volunteer organizations. Started as a symbolic lights-out event in Sydney in 2007, Earth Hour is one of the world’s most massive grassroots movement for the environment, inspiring millions of people to take action for our planet. 30 March 2019. United Nations, New York. UN Photo/Evan Schneider. 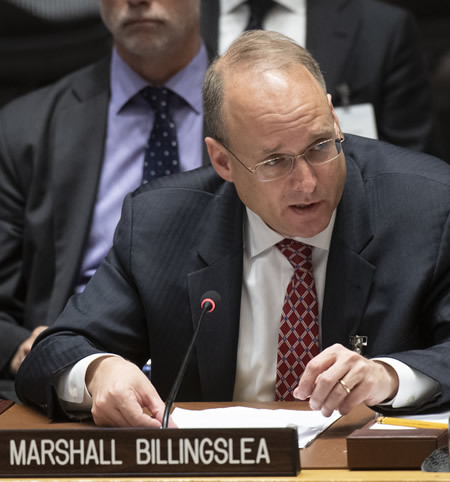 Photo: Marshall Billingslea, President of the Financial Action Task Force, briefs the Security Council on threats to international peace and security caused by terrorist acts. The meeting focused on preventing and combating the financing of terrorism. 28 March 2019. United Nations, New York. UN Photo/Eskinder Debebe. 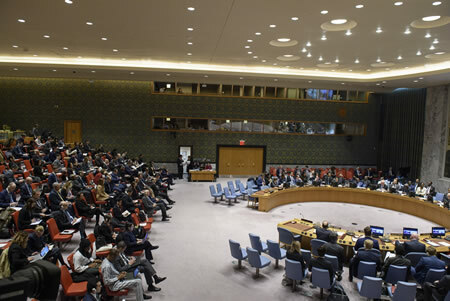 Photo: A comprehensive view of the Security Council chamber during the meeting on threats to international peace and security caused by terrorist acts. The meeting focused on preventing and combating the financing of terrorism. 28 March 2019. United Nations, New York. UN Photo/Loey Felipe. United Nations, New York, 28 March 2019 — The UN is hailing a new Security Council resolution adopted on Thursday as a landmark step in suppressing the funding of terror groups worldwide. Speaking via video-link from Rome, where he has been meeting specialist Italian law enforcement officials to discuss building closer ties to tackle the problem, the UN’s counter-terrorism chief, Vladimir Voronkov, said that the adoption comes at a “critical time,” with recent attacks demonstrating that terror groups continue to have access to both legal and illegal sources of funding. Underscoring the necessity for active collaboration and targeted efforts, to achieve “concrete results” in the fight against terrorism and terrorist financing, Mr. Voronkov said that Resolution 2462 on Countering the Financing of Terrorism, pulls together previous resolutions to create a consolidated document that also covers several critical emerging issues. The resolution calls for the UN Office of Counter-Terrorism (UNOCT) to play a leading role in identifying ways to suppress terrorist financing. The UN Office of Counter-Terrorism (UNOCT) was set up in 2017 to strengthen the Organization’s ability to implement s global counter-terrorism strategy. Mr. Voronkov identified three priorities. The first is expanding the focus of the UNOCT to cover intelligence sharing, risk assessments, and public-private partnerships. The second priority is the development of a comprehensive approach to the problem. 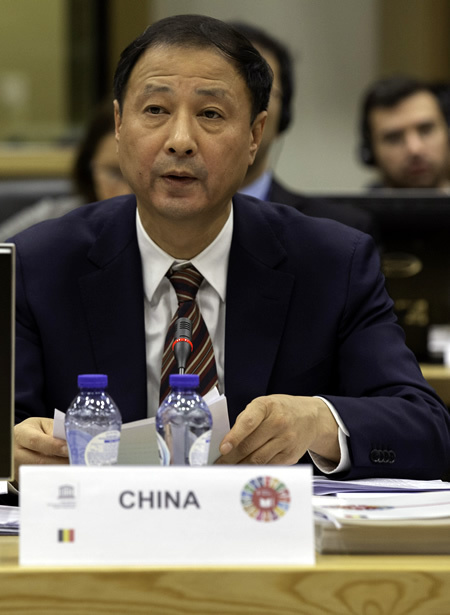 The third priority is to work closely with the Financial Action Task Force, an inter-governmental body which sets standards for combating money laundering, terrorist financing and other related threats to the integrity of the international financial system and regional regulators. 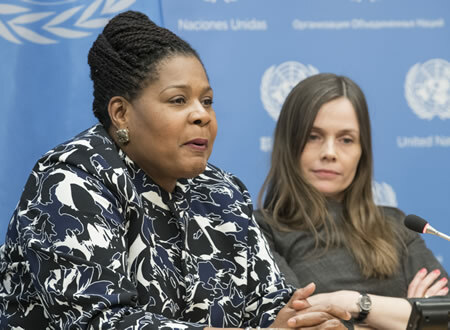 Marshall Billingslea, President of the Financial Action Task Force, and Mercy Buku, an expert in the countering of terrorist financing, also briefed the Security Council on the subject. 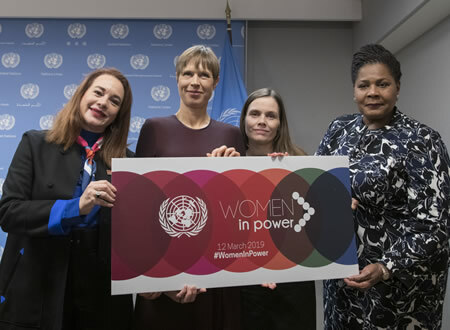 Photo: María Fernanda Espinosa Garcés (left), President of the seventy-third session of the General Assembly, poses for a photo with (from left to right): Kersti Kaljulaid, President of the Republic of Estonia; Katrín Jakobsdóttir, Prime Minister of Iceland; and Paula-Mae Weekes, President of Trinidad and Tobago, after a press briefing on the high-Level event on ‘Women in Power’. 12 March 2019. United Nations, New York. UN Photo/Mark Garten. Photo: Kersti Kaljulaid (left), President of the Republic of Estonia, and Kolinda Grabar-Kitarović, President of Croatia, brief the press on the high-level event on ‘Women in Power’ hosted by María Fernanda Espinosa Garcés, President of the seventy-third session of the General Assembly. 12 March 2019. United Nations, New York. UN Photo/Mark Garten. Photo: Paula-Mae Weekes, President of Trinidad and Tobago, briefs press on the high-level event on ‘Women in Power’ hosted by María Fernanda Espinosa Garcés, President of the seventy-third session of the General Assembly. At right is Katrín Jakobsdóttir, Prime Minister of Iceland. 12 March 2019. United Nations, New York. UN Photo/Mark Garten. 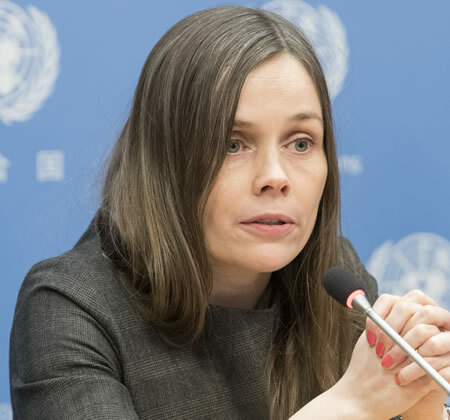 Photo: Katrín Jakobsdóttir, Prime Minister of Iceland, briefs press on the high-level event on ‘Women in Power’ hosted by María Fernanda Espinosa Garcés, President of the seventy-third session of the General Assembly. 12 March 2019. United Nations, New York. UN Photo/Mark Garten. Photo: Kolinda Grabar-Kitarović, President of Croatia, briefs press on the high-level event on ‘Women in Power’ hosted by María Fernanda Espinosa Garcés, President of the seventy-third session of the General Assembly. 12 March 2019. United Nations, New York. UN Photo/Mark Garten. 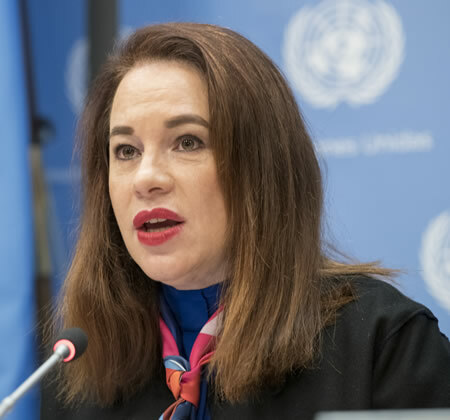 Photo: María Fernanda Espinosa Garcés, President of the seventy-third session of the General Assembly, briefs press on the high-level event on ‘Women in Power’ hosted by María Fernanda Espinosa Garcés, President of the seventy-third session of the General Assembly. 12 March 2019. United Nations, New York. UN Photo/Mark Garten. Photo: Hilaria Baldwin (center), wellness expert, and Alec Baldwin (left), actor and activist, attend the special event to launch the EAT-Lancet Commission Report on Food, Planet, Health. 05 February 2019. United Nations, New York. UN Photo/Mark Garten. 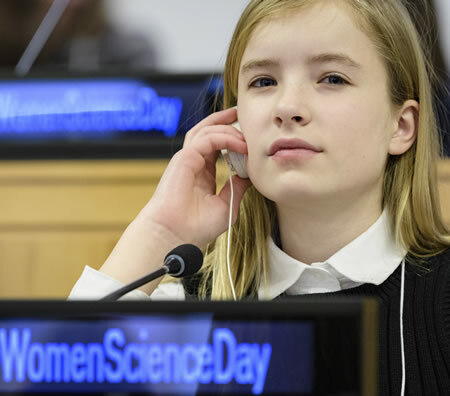 Photo: A participant at the fourth commemoration of the International Day of Women and Girls in Science (11 February). The event was co-organized by the Permanent Missions of Bangladesh, Hungary, Portugal, and the Slovak Republic, with the Royal Academy of Science International Trust, the United Nations Conference on Trade and Development, and the International Telecommunication Union. 11 February 2019. United Nations, New York. UN Photo/Manuel Elias. Photo: L’Oréal-UNESCO Awards Ceremony for Women and Science at UNESCO Headquarters in Paris. Image provided by & copyright © UNESCO / Christelle ALIX. Photo: Lauriane Chomaz, Fellow of the French program L’Oréal-UNESCO For Women and Science, with high school girls. Photo Credit & Copyright © Matthew Brookes. Image provided by L’Oréal For Girls and Science. 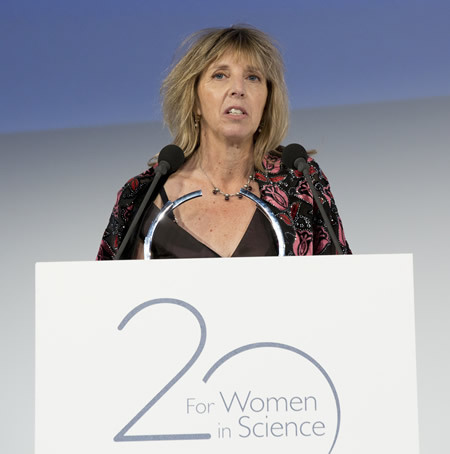 Paris, February 11, 2019 — On the occasion of the International Day of Women and Girls in Science celebrated on 11 February, the L’Oréal Foundation and UNESCO have announced the laureates of the 21st International Awards For Women in Science, which honors outstanding women scientists, from all over the world. These exceptional women are recognized for the excellence of their research in the fields of material science, mathematics and computer science. Each laureate receives €100,000, and their achievements will be celebrated alongside those of 15 promising young women scientists from around the world at an awards ceremony on 14 March at UNESCO’s Headquarters in Paris. Mathematics is a prestigious discipline and a source of innovation in many domains. However, it is also one of the scientific fields with the lowest representation of women at the highest level. Since the establishment of the three most prestigious international prizes for the discipline (Fields, Wolf, and Abel), only one woman mathematician has been recognized, out of a total of 141 laureates. Two mathematicians now figure among the five laureates receiving 2019 For Women in Science Awards. Claire Voisin, one of five women to have won a gold medal from the French National Centre for Scientific Research (CNRS), and the first women mathematician to enter the prestigious Collège de France; and Ingrid Daubechies of Duke University (USA), the first woman researcher to head the International Mathematical Union. Professor Saliba is rewarded for her pioneering work in identifying carcinogenic agents and other toxic air pollutants in the Middle East, and modern nicotine delivery systems, such as cigarettes and hookahs. Her innovative work in analytical and atmospheric chemistry will make it possible to address some of the most pressing environmental challenges and help advance public health policies and practices. Professor Maki Kawai has been recognized for her ground-breaking work in manipulating molecules at the atomic level, to transform materials and create innovative materials. Her outstanding research has contributed to establishing the foundations of nanotechnologies at the forefront of discoveries of new chemical and physical phenomena that stand to address critical environmental issues such as energy efficiency. Professor Karen Hallberg is rewarded for developing cutting-edge computational approaches that allow scientists to understand the physics of quantum matter. Her innovative and creative techniques represent a significant contribution to understanding nanoscopic systems and new materials. Among the 275 national and regional fellowship winners Unesco and L’Oreal support each year, the For Women in Science programme selects the 15 most promising researchers, all of whom will also be honored on 14 March 2019. 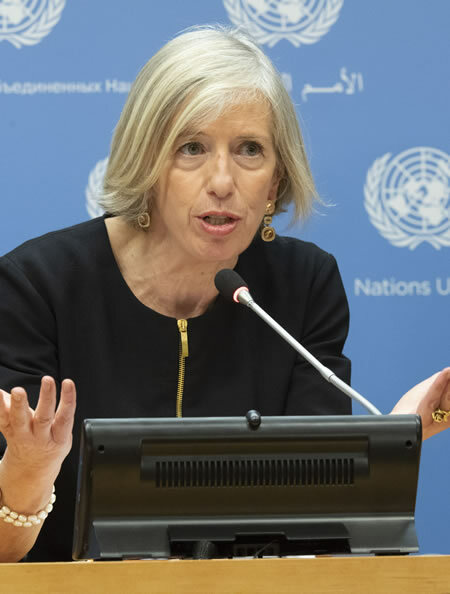 Photo: Stefania Giannini, Assistant Director-General for Education for the United Nations Educational, Scientific and Cultural Organization (UNESCO), briefs press on the occasion of the International Day of Education (24 January), in recognition of the role of education for peace and sustainable development. 24 January 2019. United Nations, New York. UN Photo/Evan Schneider. New York, 24 January 2019 — The United Nations observed the first International Day of Education to emphasize the action required to achieve the global education goals and targets in line with the 2030 Agenda for Sustainable Development. The celebration raised awareness of the crucial role of quality and relevant education for peace and development worldwide, including its contribution to poverty eradication, environmental sustainability and building peaceful and resilient societies. 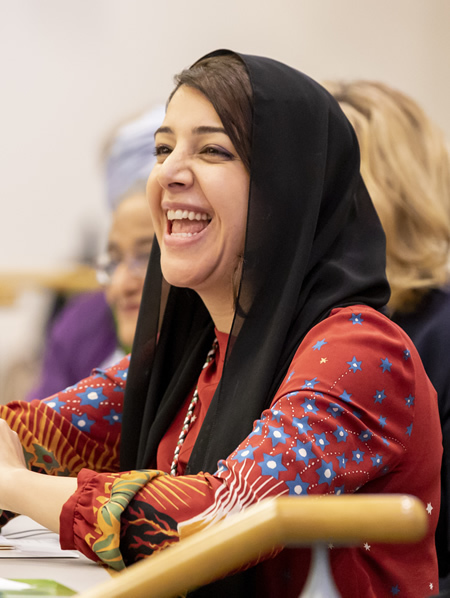 The event brought together the voices of governments, the UN system, private sector, civil society, faith-based organizations, teachers, academia and youth, united in their call to make education a leading global priority. Recently, the United Nations General Assembly had proclaimed 24 January as International Day of Education in celebration of the role of education for peace and development. Education is a human right, a public good, and a civic responsibility. Education transforms lives and is at the heart of our mission to build peace, eradicate poverty & drive sustainable development. Photo: Impressions from the Annual Meeting 2019 of the World Economic Forum in Davos, January 22, 2019. Image provided by & copyright © World Economic Forum / Sandra Blaser. Photo: Antonio Guterres, Secretary-General, United Nations, New York, captured during the Session “Special Address by António Guterres, Secretary-General of the United Nations” at the Annual Meeting 2019 of the World Economic Forum in Davos, January 24, 2019. Congress Centre - Congress Hall. Image provided by & copyright © World Economic Forum / Sikarin Fon Thanachaiary. Photo: A participant at the Annual Meeting 2019 of the World Economic Forum in Davos, January 21, 2019. Image provided by & copyright © World Economic Forum / Boris Baldinger. Davos-Klosters, Switzerland, 24 January 2019. — “If I have to select one sentence to describe the state of the world, I would say we are in a world in which global challenges are more integrated, and the responses are more and more fragmented. If these are not reversed, it is a recipe for disaster,” warned UN Secretary-General António Guterres in his address at the World Economic Forum Annual Meeting today. Tackling global crises - from combating climate change to developing a set of rules on the “weaponization of AI” - cannot be achieved by any one country, but should be addressed collectively by governments, the private sector, civil society, and academia urged Guterres. Representing an organization of 100 million people, operating in 40 countries and mobilizing some $15 billion, Guterres said that, in 2019, the UN will be pushing for a surge in diplomacy for peace in some of the world’s hotspots - including Yemen, Syria and South Sudan - and higher spending on mitigating climate change. As part of bureaucratic reform, he added that the UN expects to achieve internal gender parity by 2028. Turning to the disruptive and transformative impacts of the Fourth Industrial Revolution, Guterres suggested engaging more financial institutions to invest in developing countries and promote social and green bonds, dealing with the massive restructuring of the labor force and redesigning our education systems. The World Economic Forum Annual Meeting brings together more than 3,000 global leaders from politics, government, civil society, academia, the arts, and culture as well as the media. It engages some 50 heads of state and government, more than 300 ministerial-level government participants, and business representation at the chief executive officer and chair level. Convening under the theme, Globalization 4.0: Shaping a Global Architecture in the Age of the Fourth Industrial Revolution, participants are focusing on new models for building sustainable and inclusive societies in a plurilateral world. Photo: Christoph Heusge, Permanent Representative of Germany to the United Nations, holds his country’s flag during the flag installation ceremony held to honor the newly-elected non-permanent members of the UN Security Council for the term 2019-2020. 02 January 2019. United Nations, New York. UN Photo/Eskinder Debebe. Photo: Miguel Vargas Maldonado, Minister for Foreign Affairs of the Dominican Republic and President of the Security Council for January, addresses the press during the flag installation ceremony held to honor the newly-elected non-permanent members of the UN Security Council for the term 2019-2020. 02 January 2019. United Nations, New York, UN Photo/Eskinder Debebe. Photo: Marc Pecsteen de Buytswerve, Permanent Representative of Belgium to the United Nations, holds his country’s flag during the flag installation ceremony held to honor the newly-elected non-permanent members of the UN Security Council for the term 2019-2020. 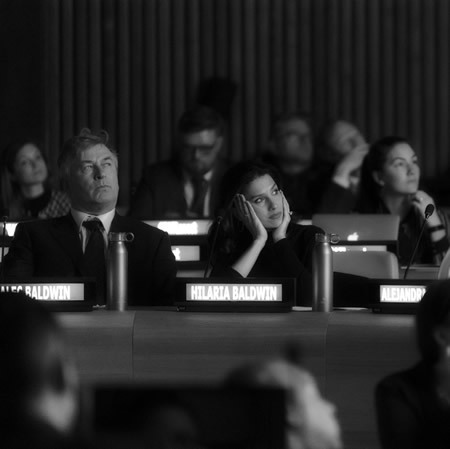 02 January 2019 United Nations, New York. UN Photo/Eskinder Debebe. Photo: The Taj Mahal, Agra, India. Taj Mahal is a UNESCO World Heritage Site. Image Credit: Otis Yang. New Delhi, December 22, 2018 — India’s Ministry of Culture has informed the Indian Parliament that, at present, India has 42 sites listed under UNESCO’s tentative list which is a pre-requisite condition for inscription as World Heritage Sites. This year, ‘The Walled city of Jaipur’ is under process for nomination of World Heritage Site. The dossier on ‘Monuments Forts of Deccan Sultanate’ has already been submitted to UNESCO for the 2019-20 initiative, the Ministry said. Augmentation of sites on the World Heritage List/Tentative List is a continuous process. UNESCO selects the heritage sites on the basis of their potential for fulfilling criteria under Operational Guidelines and demonstration of Outstanding Universal Value, India’s Minister for Culture, Dr. Mahesh Sharma, explained. All the world heritage sites are well protected and are in good shape. 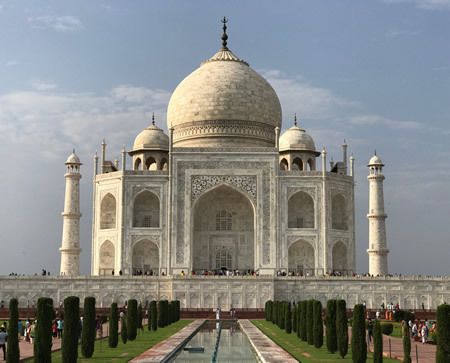 India is conserving all these sites in accordance with the UNESCO’s conservation policy, India’s Minister for Culture, Dr. Mahesh Sharma, told the parliament. 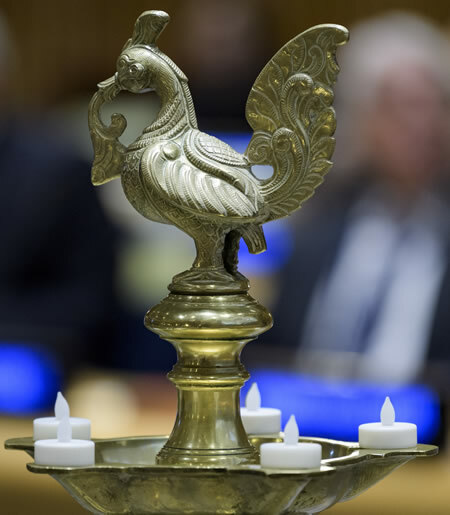 United Nations — Award Ceremony: Diwali - "The Power of One"
Photo: A view of an ornamental lamp at the ceremony presenting “The Power of One” awards to commemorate the issuance of the Diwali Stamp by the United States Postal Service. 11 December 2018. United Nations, New York. UN Photo/Manuel Elias. 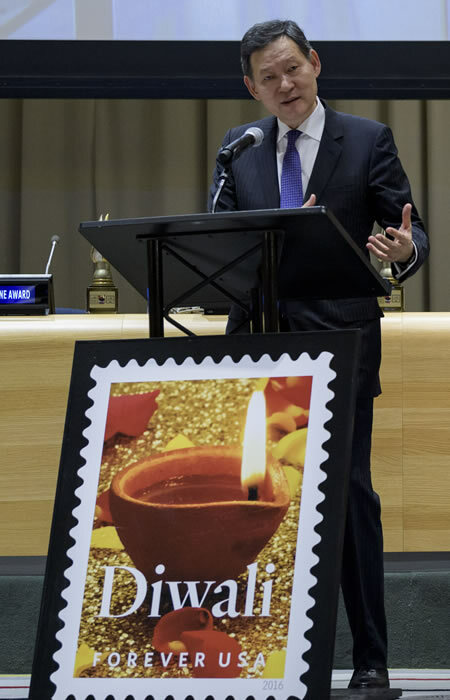 Photo: Kairat Umarov, Permanent Representative of Kazakhstan to the United Nations, addresses the ceremony presenting “The Power of One” awards to commemorate the issuance of the Diwali Stamp by the United States Postal Service. 11 December 2018. United Nations, New York. UN Photo/Manuel Elias. The award, established by Diwali Foundation USA, Inc. in 2017, aims to celebrate and highlight the vital role of diplomats and international officials in promoting peace on Earth. New Delhi, December 12, 2018 — The UNESCO Office in New Delhi in collaboration with Participatory Research in Asia (PRIA), hosted the first-ever Consultation of UNESCO Chairs, from 10-11 December 2018 in New Delhi. The primary objective of the consultation was to build a more informed and active network of UNESCO Chairs in India and to brainstorm and share ideas on the role of UNESCO Chairs in strengthening the work of UNESCO. The two-day consultation saw the participation by all 11 UNESCO Chairs in India. On Day 1, the UNESCO New Delhi Director, Eric Falt, welcomed all the participants at UNESCO House, which was followed by the screening of a Film on UNESCO’s 70 years in India. The reception at the UNESCO House was a unique opportunity for all the 11 Chairs present to introduce themselves and to build meaningful networking in an informal setting. On the second day, the meeting started with an address by Dr. Rajesh Tandon who warmly welcomed all the UNESCO Chairs in India to PRIA campus. UNESCO New Delhi Director, Eric Falt made a presentation highlighting critical activities undertaken by the different sectors in the New Delhi Office. 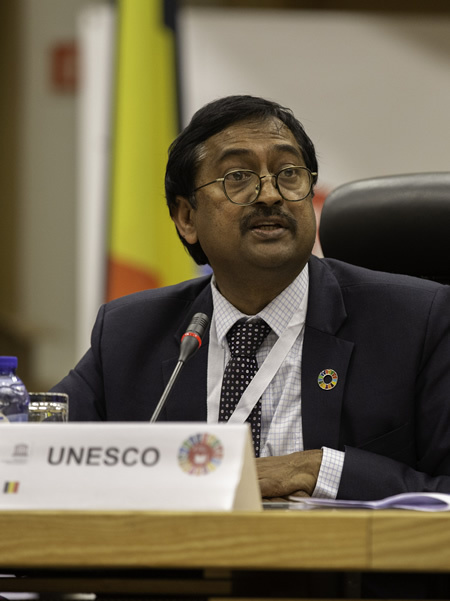 Dr. N. Saravana Kumar, Joint Secretary (ICC), Ministry of Human Resource Development (MHRD) thanked UNESCO for organizing the meeting and highlighted the need to engage meaningfully with the UNESCO Chairs in strengthening the programmes and policies of MHRD. During the work session, the Chairs brainstormed about enhanced collaboration with UNESCO New Delhi and how they could further UNESCO’s agenda in their respective areas of specialization. The members presented key ideas which included reinforcing the network of UNESCO Chairs by setting up e-groups for enhanced networking and knowledge sharing and promoting core values of UNESCO through their ongoing courses and programmes. The UNITWIN/UNESCO Chairs Programme consists of the establishment of UNESCO Chairs and UNITWIN (University Twinning and Networking) Networks in higher education institutions. Because of the nature and flexibility of the UNITWIN/UNESCO Chairs Programme, universities can respond more readily and with greater autonomy to the demands for new learning and research in a world undergoing rapid economic, social and technological change. India has established 11 Chairs on different subjects. 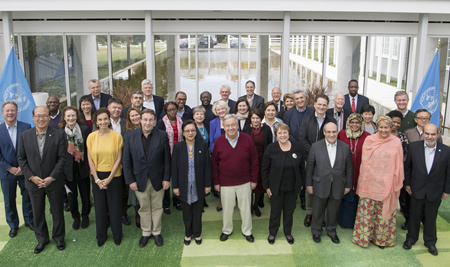 Photo: Global Education Meeting. December 5, 2018. Brussels, Belgium. Image provided by & copyright © UNESCO / G Chekaiban. UNESCO brought together Ministers, representatives of Member States, multilateral organizations, civil society, the teaching profession, youth, and the private sector. Gianini sought consensus on building an education partnership platform engaging the gamut of development partners across industries. She highlighted the complementary roles and the strengths of partners around the table to keep education on top of the political and private sector agenda. 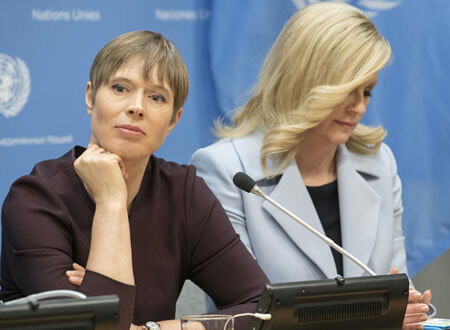 United Nations Special Advocate for the Sustainable Development Goals, Queen Mathilde of Belgium, and UNESCO Special Envoy on Literacy for Development, Princess Laurentien of the Netherlands, called for partnerships with non-educational players and the private sector. Princess Laurentien urged development partners to make education relevant to other industries and emphasize the shared responsibility of the 2030 Sustainable Development Agenda, adopted by the United Nations in 2015. UNESCO announced that the WIDE (World Inequality Database on Education) platform would be further developed through the Global Education Monitoring Report and UNESCO Institute of Statistics to understand better inequalities within countries in ensuring access to education, participation, completion, and learning outcomes. 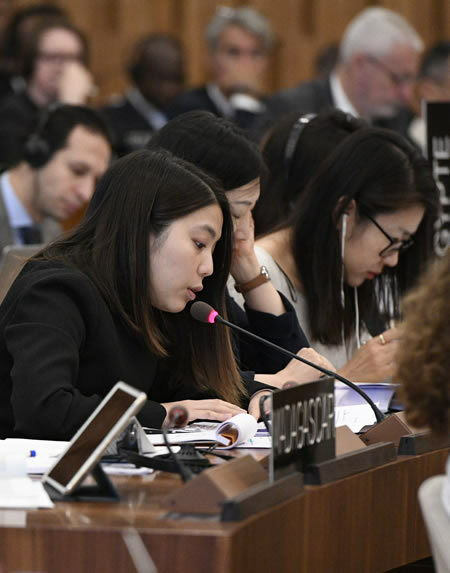 Although the Global Education Meeting only takes place every four years, partners would work on a continual basis, on the harmonization and strengthening of support to Member States and partners to achieve the education-related targets of the global agenda. 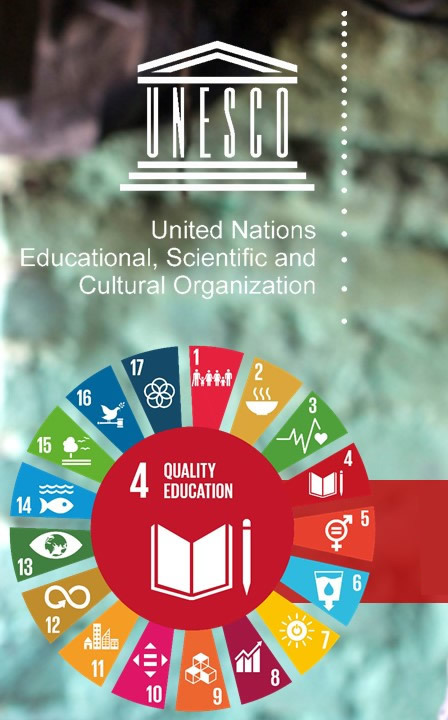 This work would be carried out through the UNESCO led SDG-Education 2030 Steering Committee, the global multi-stakeholder mechanism for education in the 2030 Agenda. Gianini closed the Meeting saying, “2019 is the year of education. We have an opportunity that we cannot and must not waste. Beginning with the new International Day of Education on 24 January, to the High-Level Political Forum and G7 in July, to the UNGA 2019, and the UNESCO General Conference in November. It is a time for action”. Photo: The Vice President of India, M. Venkaiah Naidu, presenting Naatya Padhmam Award to Shreemati Malavika Sarukkai at the Golden Jubilee Celebrations of Brahma Gana Sabha in Chennai on December 02, 2018. Chennai, December 2, 2018 — The Vice President of India, M. Venkaiah Naidu has said that art and dance forms act as a bridge between the ancient and the modern value systems. He was addressing the gathering after inaugurating the Golden Jubilee Celebrations of Brahma Gana Sabha, in Chennai today. The Vice President presented - Gaana Padhmam Award to the legendary classical musician, Dr. K.J. Yesudoss, Naatya Padhmam Award to Smt. Malavika Sarukkai and Naataka Padhmam Award to Shri Varadharajan. The Vice President said that classical music and arts express India’s cultural glory and represent the eternal and everlasting principles of life that promote discipline, obedience, and peaceful coexistence. Naidu said that music in any form acts as an equalizer. It has no barriers or boundaries. It speaks the universal language. Music, art, and culture promote the concept of oneness. “Brahma Gana Sabha has grown into a huge brand in 50 years. Its annual music festivals are well known. Events such as these have put Chennai on the world cultural map and gave the city a place in UNESCO’s Creative Cities Network for contribution in Music. Chennai is the third Indian city on the list of UNESCO Creative Cities list. UNESCO has also recognized Varanasi as City of Music, and Jaipur as City of Crafts and Folk Art.” Mr. Naidu said. “Indian musicians have given the world a rare menu of soul-stirring musical masterpieces. The electronic era has brought new dimensions to music concerts. We must preserve the best traditions we have inherited, and add further richness with our creative genius,” the Vice President concluded. 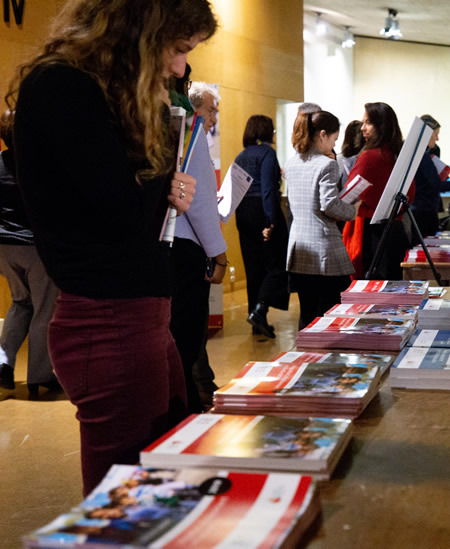 Photo: Launch of the 2019 Global Education Monitoring Report. November 26, 2018. UNESCO Headquarters, Paris. Image provided by and Copyright © UNESCO/Christelle ALIX. Photo: Mobile Learning Week. March 2018. UNESCO Headquarters, Paris. Image provided by and Copyright © UNESCO/Christelle ALIX. File Photo. Paris, France, 23 November 2018 — Some 350 ministers, officials, representatives of development agencies and other partners from all over the world will take stock of progress in meeting the educational objectives of the United Nations 2030 Sustainable Development Agenda during the Global Education conference, 3 to 5 December, in Brussels, Belgium. 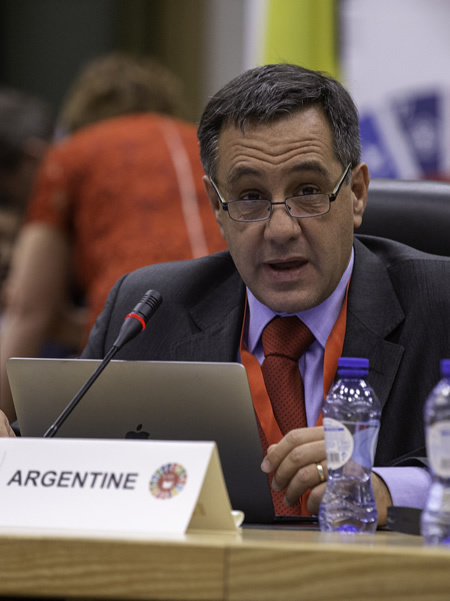 In its mandated role as lead agency and coordinator of the Education 2030 Agenda, UNESCO has convened the Global Meeting with the support of the Government of Belgium. It is the first Global Education Meeting since the adoption of the Sustainable Development Agenda in 2015. The meeting would focus on the need to reduce inequalities in education. It will also examine the links between education and the Sustainable Development Goals on Decent Work, Economic Growth, Reduced Inequalities, Climate Action, Peace, Justice, and Strong Institutions. Organized by UNESCO in consultation with the SDG-Education 2030 Steering Committee, and hosted by the government of Belgium, the meeting will address urgent priorities in a world that still numbers 262 million out-of-school children, adolescents, and youth. The data also show that 617 million children and adolescents — i.e., six out of ten — are unable to read a simple sentence or handle necessary mathematic calculations. 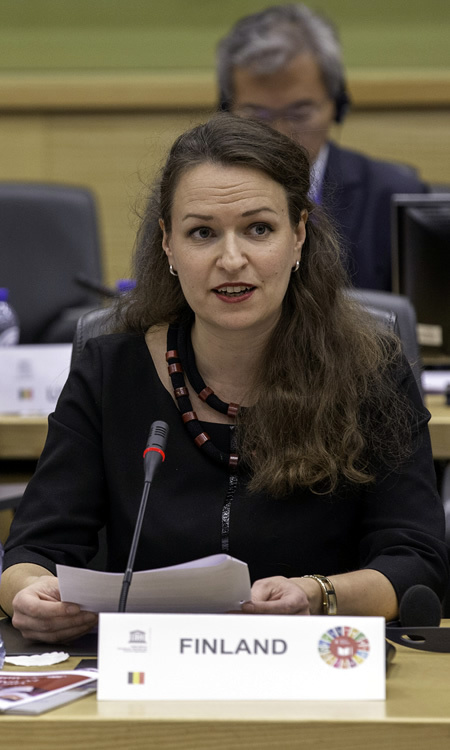 Queen Mathilde of Belgium will officially open the meeting (4 December, 2 PM) alongside Stefania Giannini, UNESCO’s Assistant Director-General for Education, Ambassador Inga Rhonda King, President of UN ECOSOC, and Tibor Navracsics, European Commissioner for Education, Culture, Youth and Sports. Amina J. Mohammed, UN Deputy Secretary-General will deliver the keynote address. Photo: Forum pour la Gouvernance d’Internet. 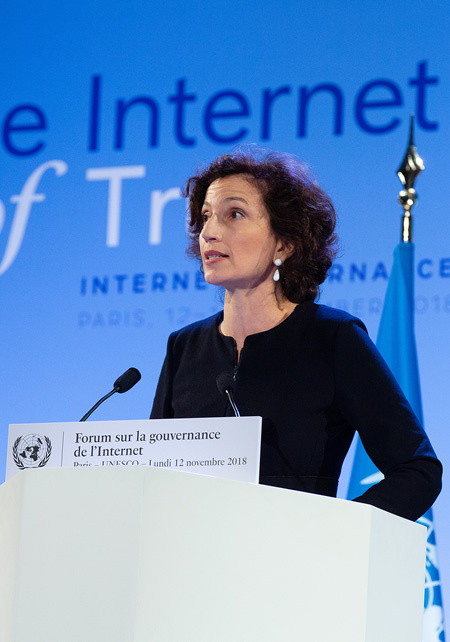 UNESCO Director-General Audrey Azoulay addresses the Internet Governance Forum. November 2018. UNESCO Headquarters, Paris. Image provided by and Copyright © UNESCO/Christelle ALIX. Photo: Forum pour la Gouvernance d’Internet. 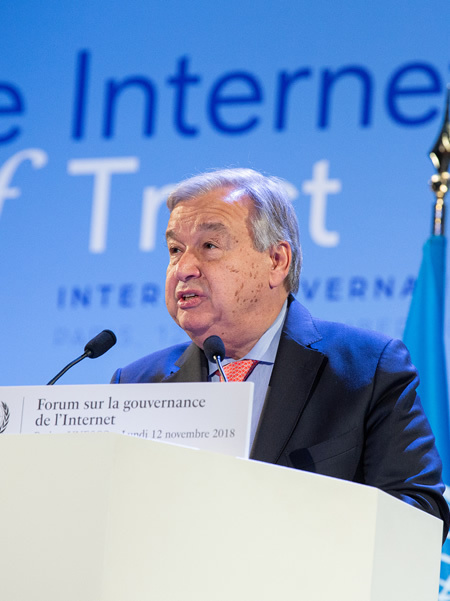 António Guterres, Secretary-General of the United Nations, addresses the Internet Governance Forum. November 2018. UNESCO Headquarters, Paris. Image provided by and Copyright © UNESCO/Christelle ALIX. Paris, France, November 28, 2018 — France hosted this year’s Internet Governance Forum at UNESCO in Paris. The Forum examined ways to build an internet of trust that contributes to sustainable development and the building of knowledge societies, free of campaigns that spread hate and divisiveness. UNESCO Director-General Audrey Azoulay opened the Forum alongside António Guterres, Secretary-General of the United Nations, and Emmanuel Macron, President of France. More than 3,000 representatives from governments, the United Nations, regulatory bodies, the civil society, and academia took part in the Forum. 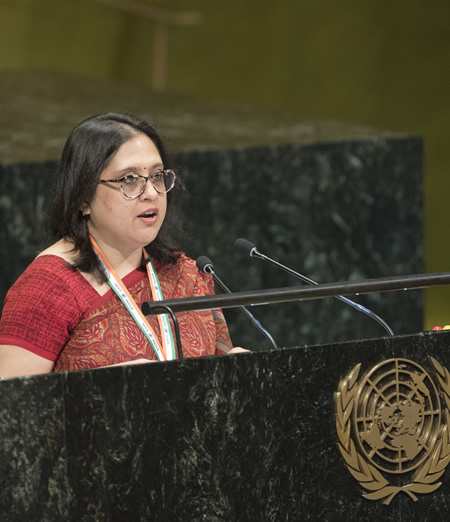 Convened by the Secretary-General of the UN, the Forum highlighted the need to uphold human rights in the digital environment. Specific topics addressed included the digital divide, gender equality, the impact of artificial intelligence, and frontier technologies. The forum also discussed issues concerning cyber security, countering hate speech, and violent extremism. 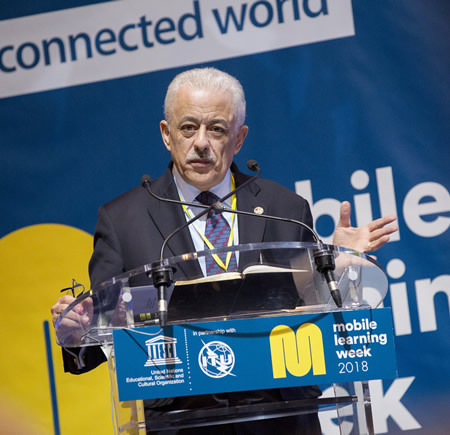 UNESCO is working to maximize the potential of the internet in fostering sustainable human development and enhancing the free flow of information and ideas worldwide. The Organization advocates transparent internet governance that guarantees universal access and respects human rights, ethical principles, freedom of expression, privacy, cultural differences, and linguistic diversity. Photo: The Vice President, M. Venkaiah Naidu, with the Director-General of UNESCO, Ms. Audrey Azoulay, on his visit to the Headquarters of UNESCO, in Paris, France on November 09, 2018. 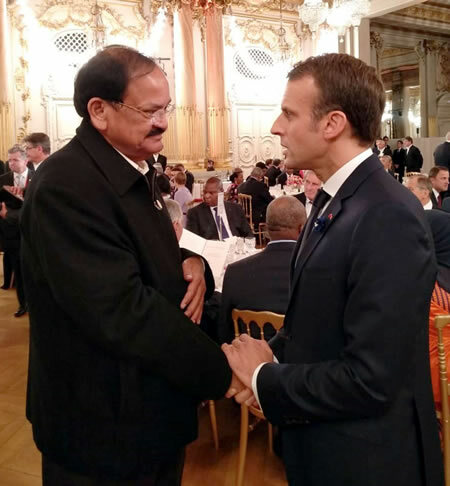 Photo: The Vice President, M. Venkaiah Naidu, meets the President of France, Emmanuel Macron, at the banquet hosted by the President of France, in Paris, France on November 10, 2018. Paris, France, November 10, 2018 — The Vice President of India, M. Venkaiah Naidu has said that India has always been a voice for peace and non-violence from time immemorial. He was addressing the Indian Diaspora at UNESCO in Paris, France, yesterday. Saying that peace is the only pre-requisite for progress, the Vice President said that in an interdependent world, progress could be achieved only through dialogue and understanding. Earlier the Vice President interacted with Director-General of UNESCO, Ms. Audrey Azoulay, and apprised her about India’s efforts to achieve the 2030 agenda for Sustainable Development in all the fields including education. They also discussed matters such as the use of information and communication technologies to improve access to education, enhancing the quality of teaching-learning process and teacher development programmes, strengthening educational planning and management, and improving monitoring systems. The Vice President is in Paris, France, to attend the centenary year of the end of First World War. He will also be participating at a global event at Arc de Triomphe in which he will pay homage to the martyrs of World War I. He will also inaugurate the Indian Armed Forces Memorial at Villers Guislain as a tribute to several thousand Indian soldiers whose gallantry and dedication have earned worldwide recognition. 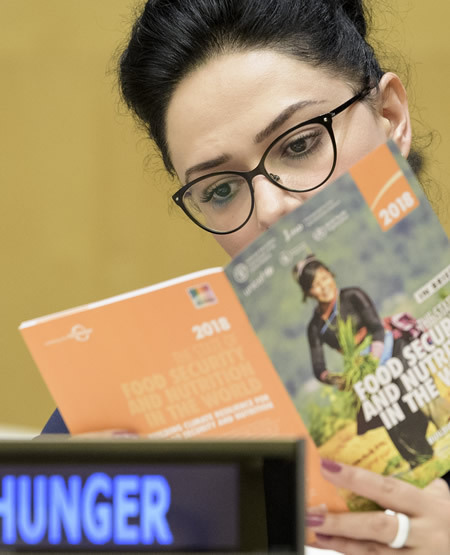 UN Briefing on "State of Food Security and Nutrition in the World and State of Food and Agriculture"
Photo: A participant at the high-level briefing by the principals of the Food and Agriculture Organization of the United Nations (FAO), the International Fund for Agricultural Development (IFAD) and the United Nations World Food Programme (WFP) on “The State of Food Security and Nutrition in the World and The State of Food and Agriculture”. 06 November 2018. United Nations, New York. UN Photo/Manuel Elias. 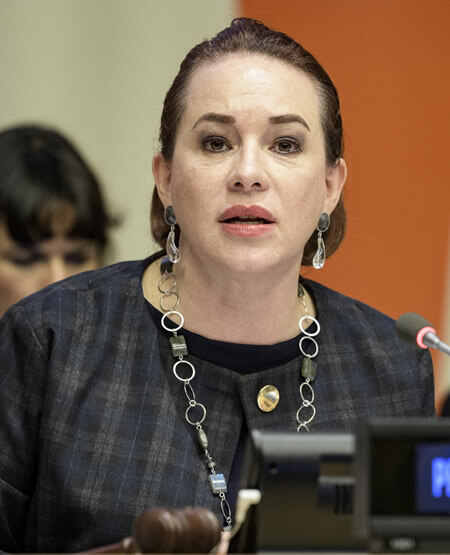 Photo: María Fernanda Espinosa Garcés, President of the seventy-third session of the General Assembly, addresses the high-level briefing. 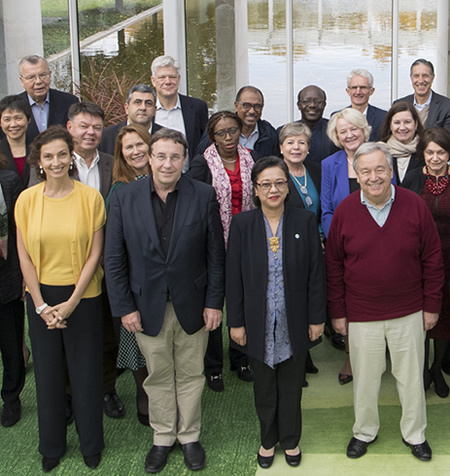 The principals of the Food and Agriculture Organization of the United Nations (FAO), the International Fund for Agricultural Development (IFAD) and the United Nations World Food Programme (WFP) addressed the media on “The State of Food Security and Nutrition in the World and The State of Food and Agriculture.” 06 November 2018. United Nations, New York. UN Photo/Manuel Elias.